Subsea ball valves are externally sealed design for depths to 14,000 feet (4200 meters). All valves are internally pressure tested to at least 50% over rated pressure and have a typical service life guarantee of 25 years and Manufactured to meet the requirements of NACE MR0175, API Spec 6A & 17D, ASME, ANSI and various others. API 6A , 19th ed., ISO 10423:2003 PR2, Annex F/PSL3G qualified valves available. Subsea ball valves are custom designed for instrumentation, process control and chemical injection applications. Remote operated vehicle (ROV) capabilities in template control panels, subsea wellheads and christmas trees. Subsea ball valves provide trouble free operation in a variety of media including hydrogen sulfides, corrosion inhibitors, paraffin thinners, hydraulic fluids and other harsh chemicals, and s may be produced in any machinable metal with special seal materials. Standard materials include 316 cold-worked stainless steel and high pressure super duplex. 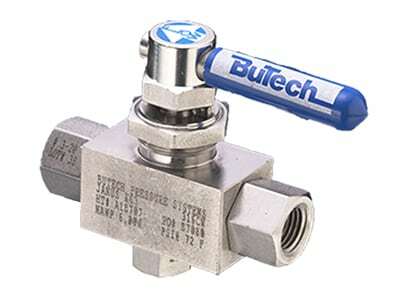 2-way ball valves come in 3/8’, 1/2” and 1” configurations; 3-way ball valves come in 3/16’, 3/8” & 1/2” configurations, and 4-way ball valves come in a 3/8” configuration. Rapid quarter turn action provides quick open/close action for easy ROV / diver operation. Independent spring-loaded seals for full differential pressure. Trunnion mounted ball design and blowout proof stem for maximum safety. Externally sealed design for depths to 14,000 feet (4200 meters). Easy mounting for ROV, diver or remote actuation. PEEK® seats to offer resistance to chemicals, heat and wear/ abrasion. Unlimited replaceable end connection capabilities for installation versatility. Double barrier o-rings or cup seal options to prevent the ingress of seawater. Full port flow path through valve to minimize pressure drop. Can’t Find The Product You Need? Just Ask Us!